It’s one thing for an elite medical system, with abundant resources and manpower to put together a useful app for their patient base. For smaller, community-based facilities, it presents more of a challenge. None of this deterred Henry County Health Center, a 25-bed facility in Iowa, from rising to meet this challenge. The fruit of their labors was HCHC Healthy Living, a convenient tool with several resources that empower patients to take control of their health; and recently branded as a multiple award-winning mobile app. What Sets HCHC Healthy Living App-art? 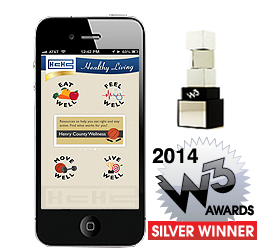 Already with a 2013 WebHealth Bronze Award on its resume, HCHC earned a Silver this week, in the 2014 w3 Awards. The app’s success has been driven by the excellent features, which the HCHC team included for their patients. From medication and appointment trackers, to healthy eating tips and recipes, and even fitness plans with built in workout music, the app provides the Henry County community with everything they need to maintain a healthy lifestyle and connect with their provider should life throw a curveball. Despite the smaller budget of a local facility, HCHC put together an exceptional resource, which they could place directly into the hands of the citizens they serve. While typical app development can cost tens of thousands of dollars and take months to produce, HCHC turned to the MobileSmith platform to assist with their mobile needs. Within a few short weeks, and without any programming, HCHC produced Healthy Living, at huge savings, both in development and management costs; and, as the awards clearly indicate, without sacrificing any quality. The success of the HCHC Healthy Living has been such, that the facility created a dedicated Healthy Lifestyle department for their patients. HCHC regularly brings the latest innovative tools to their community and are well placed to continue that service in the future, perhaps in the form of more award-winners. Their efforts are indeed paying off, and their Silver Award win at the W3 serves as a reminder that any facility, no matter the size, can engage patients, and even win awards, with a mobile app.